Several people have written or tweeted to ask for a report on my chat with Helene Grimaud last weekend at the Institut Francais. Delighted, my dears. I didn't record the interview, so this is a summary rather than a transcript (but the IF did have some cameras in, so if they do anything with the film I shall let you know). Helene arrived in relaxed mode: she wore jeans, boots and a warm jacket. Our venue was the IF's comfortable Cinematheque and we had a healthy audience turnout — at a guess I'd say between 80 and 100. We started off by looking back over Helene's early years and her breakthrough moments: she was accepted into the Paris Conservatoire at the age of 13, and even if this sounds young to us now, she says she felt very lucky to be able to pursue her studies there so early, as the conservatoire changed its regulations the year after. I was struck constantly by Helene's sense of good fortune and downright humility. Nothing pretentious, affected or puffed-up here; just a straightforward, down-to-earth and highly intelligent woman who's at the top of her game yet takes nothing for granted. In an age when so many people — including a lot of musicians, but by no means only them — exist in what one can only call an excessive sense of entitlement, it was deeply refreshing and encouraging to meet someone who constantly appreciates the fact that she is there at all. How does she cope with the constant travel, the pressures, the nerves? "It's a privilege to have this life," she said. You have to remember that; it helps. We devoted some time to discussing the contents of her new CD, "Resonances", which was also the programme for her Royal Festival Hall recital on Tuesday. Mozart, Berg, Liszt and Bartok. She explained that the "red thread" that ties together the aesthetics of these very different composers is a musical journey down the Danube from Vienna to Budapest. She's a French pianist who doesn't play French music — why is that? French musicians are always under excessive pressure to play the works of their fellow countrymen. But it's nothing complex, she says: she just feels more at home in the repertoire of the German romantics and central Europeans. 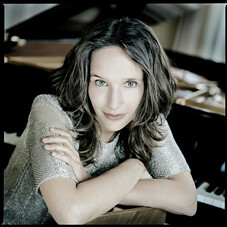 The traditional French School of pianism — characterised by jeu perle, the very 'digital', fleet-fingered, light and clear touch — is not as prevalent as it once was, since pianistic style has become much more homogeneous; her teachers were as much under the influence of the Russian school as the French, for example. Is something lost here, though? Probably, she says; there is always a downside to everything; but on the whole she sees it as a positive development. She described discovering the Berg Sonata Op.1 when she was 11: she saw the score sitting on her teacher's piano, annotated in a plethora of different coloured pencils, and wondered what sort of amazing piece could attract such a rainbow of markings? She read through the first page or so, which at that time was all she could manage, and was enchanted by the music's extraordinary, hypnotic soundworld. But she had not come back to the work to study or perform it until the current recording and tour. As for the Liszt Sonata in B minor, I asked her whether she conceives it in abstract or narrative terms. "Abstract," she insisted. Exploring a piece like that in terms of the telling of a story is too restrictive. How does she feel after performing this incredibly intense, unbroken half-hour piece — exhausted or exhilarated? "A bit of both!" And the recording process? Not entirely like everyone else's. First, so many musicians I know find themselves pressured to record one-composer discs, complete collections that are easy to stock in the shops. Helene, though, often produces multi-composer recital discs with interesting titles...like "Resonanaces". She agrees that record companies tend to prefer the other kind. But she thinks that varied recital programmes can be a lot more interesting. I can only infer, really, that she is big enough to call the shots herself on this. Unusual, too, is the fact that she prefers to record a programme first, then tour it afterwards. It's about freshness of response, essentially; and in the studio, she says, the first couple of takes are always the best. She has recorded several CDs live and had planned to do so with "Resonances", but an operation earlier this year left her with a lengthy recuperation and she had had to rethink and make the recording in a studio instead. What about the wolves? They are going strong; the Wolf Conservation Center has succeeded beyond her wildest dreams and is now home to 32 animals. She's sorry not to have been able to go over and visit them this year — her home is no longer the US, but Switzerland — but was eager to stress that the centre's educational work is all-important, teaching youngsters about these fabulous creatures' lives and habitats. The centre is also involved in a project that seeks to reintroduce wolves to the wild, which Helene says is a fantastic recent development. She added that her own relationship with the animals has attracted rather too much attention, being of seriously secondary importance to the significant conservation work the centre undertakes. Your summary was so lovely that I felt I had been there! Many thanks for sharing. Thank you so much for this lovely sum-up of your talk with Helene ! That is a small comfort after having missed the real thing ! Merci et bon courage pour les lecons de Francais !